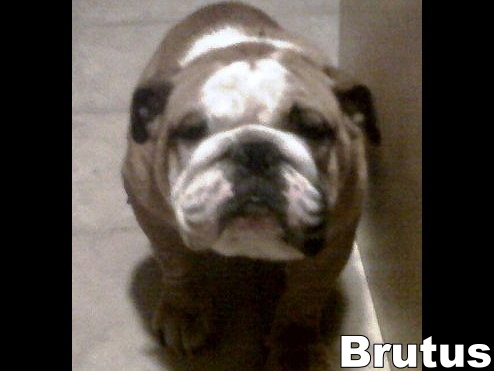 Brutus was surrendered to rescue because his owner could not take care of him. He is a very nice boy who gets along with cats and other dogs and loves people. Brutus will make a wonderful family pet! Brutus was surrendered to rescue because his owner could not take care of him. He has a lot of hair loss because he was being fed a very cheap dog food (Old Roy). He is a very nice boy who gets along with cats and other dogs and loves people. He hasn't been taught how to walk on a lead or basic things but he is very willing and his foster Mom is very pleased with his responsiveness. We will schedule a neuter for him before he is placed. Brutus will make a wonderful family pet! Home check, vet check, reference check and adoption fee apply. Be sure to have an adoption application on file! We do not adopt further than 1 hour from St. Louis!